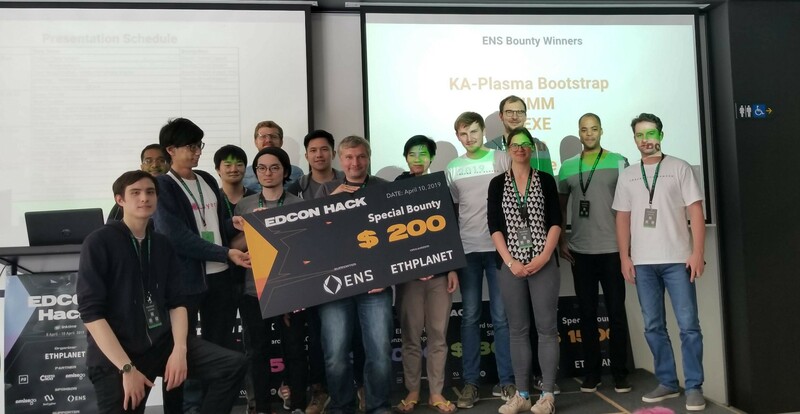 ENS lead developer Nick Johnson with the members of the 5 teams that won $200 each for being the best projects to integrate ENS. 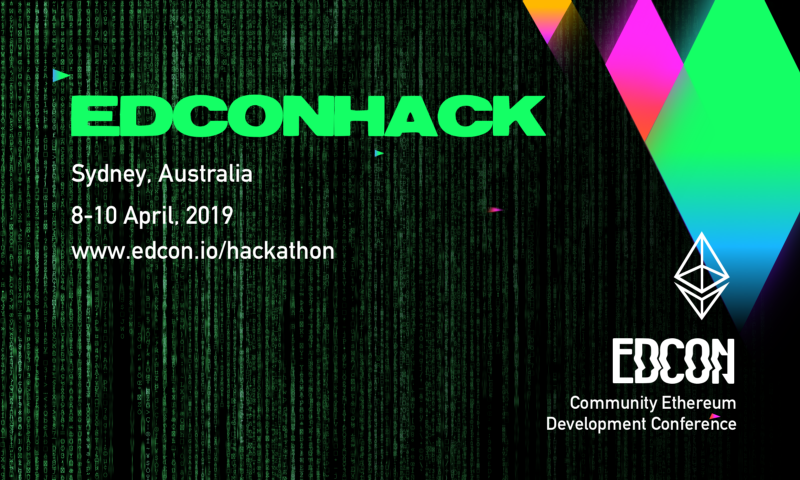 The Ethereum Name Service (ENS) is proud to have been a sponsor of the inaugural EDCON Hackathon last week! 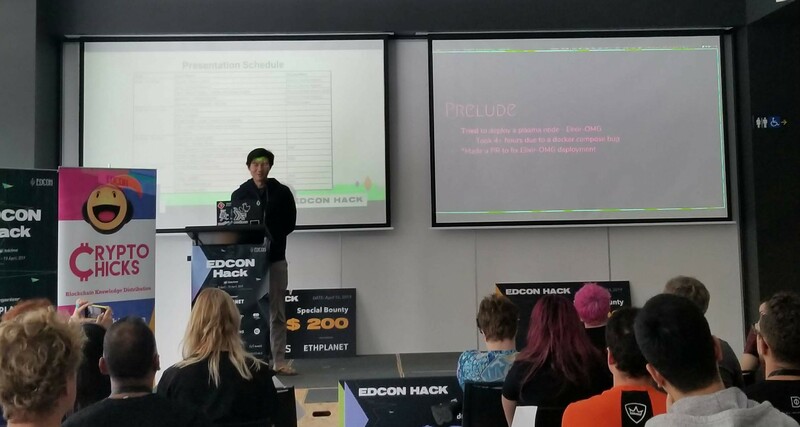 On our part, our lead developer Nick Johnson served as a judge and gave a tech talk on ENS and how to integrate it. We also offered $200 to each of the five best projects to integrate ENS (of the nine projects that did! ), and we are happy to feature them below. Our lead developer Nick Johnson finishing a presentation on how to integrate ENS. With some of the projects, you may think that the ENS integration is “minimal,” that it’s really a project about something else with a little bit of ENS sprinkled on to qualify for our side-prize. But that’s the point: ENS is a basic part of any complete Ethereum dapp. We believe that in every instance a user might otherwise see an Ethereum address or content hash, they should instead see an ENS name. ENS is not something your dapp might use, it’s something without which your dapp is unfinished. Created by Felix Leupold, Tobias Schubotz, and chris (Devpost username), WIMM is a simple online interface that let’s you quickly view all the tokens and digital assets you own in one place… in case you forget what you have! ENS integration: You can look up your information using your ENS name (instead of your Ethereum address). You can view their submission page here and try it out online here. Built by Dominik Harz, Yohei Oka, Osuke, and Shun Tak, ZEKE on Plasma is a protocol to create arbitrary contracts and let’s you execute transactions protected by zk-SNARKS. ENS integration: Used ENS to name plasma addresses. You can view their submission page here. Built by Kendrick Tan and Adrian Li, Plasma Bootstrap adds monitoring, visualization, and an alert system to an existing plasma node. ENS integration: Used ENS in their monitoring configuration. Created by real-python (Devpost username), Fire is a data analysis framework for tracking how users are using a service. ENS integration: Set up to track ENS usage. Built by Joseph Hilsberg, Chad Lynch, Sidney Amani, and Nikesh Nazareth, Stryve.network is a dapp that let’s you set a personal challenge, raise money, and then have the money automatically go to different places depending on whether you meet that challenge (as determined by a pre-set referee). ENS integration: You can input an ENS name in all the fields that also accept Ethereum addresses.